Mustang Mountain books are about a girl's ranch in Alberta and the adventures she has with her friends up there. It is a very exciting series of 10 books! Meg would do almost anything to go to Mustang Mountain Ranch -- even put up with her snobby friend, Alison. They're going to spend the whole summer with Alison's cousin Becky on a ranch high in the Rocky Mountains. Meg wants a horse so badly. Maybe she'll find a horse on the ranch that will be her special friend. But at the last minute, their trip is delayed and they head into the mountains too late. A sudden storm, an icy road -- an adventure begins that will take Meg, Alison and Becky far off the beaten track to a place where cougars, wild mustangs and grizzly bears roam free. To reach Mustang Mountain, they will need every scrap of courage they possess. How good Becky's parents dump her on this wilderness ranch? When Becky is sent to the ranch high up in the Rocky Mountains with new friends Alison and Meg she soon finds her new home boring. Caught in a snowstorm the girls must coax a pretty white horse to safety, rescue a good looking adventurer from his crashed plane... and then they come face to face with a grizzly bear! These books are great! They're about three girls: Meg, Alison, and Becky. Alison and Becky are cousins. Becky is a country girl who has to go live with her snobby, city cousin in New York. She doesn't like the thought of leaving her home, the ranch, but she needs to go to school and she's too far away from town to go to school at her family's ranch, "Mustang Mountain Ranch." It's about the three girls and their fun and exciting adventures! You have to read them all! i loved them and who thinks thomas and meg are great to read about. i love windy and wildfire breezy and just wondering the author wrote ten. these were the best series ever! there are other books by the author and I can't wait to read them!!!! I've only read the first book but i loved it!!!! These books are sooooo awesome! Probably the best western horse series there is!!! I highly recommend these books. I LOVE Mounstang Mountain books I love to read them all the time, some times I fell like I am there when I read !!!! i really love mustang mountain books there the best books in the world and if people don't like mustang mountain books they're weird. I love Mustang Mountain! I have numbers 1-10 and have read them at least 3 times each, and over 5 times for almost all of them. They are my favorite series in the world; I could read them over and over and over again! I'm in the middle of the first and I'm trying to order the rest off the internet.It's hard cause every website that's selling them is American and I'm british so I don't have dollars! I'm enjoying it so far and I want to read the rest! I think I'll finish the books I'm in the middle of, first though! 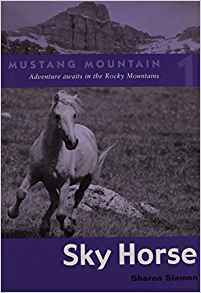 the mustang mountain series is a fun adventurous series of books that are brilliant for horse loving children or teenagers. I love them!!!!!!!!!!!!!!!!!!!!!!! The mustang mountain series is about three girls Alison, Meg and Becky and they are on a ranch in alberta. i love the series and there is 10 books of the series. my favourite book in the series is Night Horse.